These are just a few of the thoughts that went through my mind the first time I heard about Survive to Five. It is a program through World Vision that helps children all over the world live until their fifth birthday and beyond. The program provides vaccinations, medicine, clean water, neonatal care and more to babies and birth mothers, giving them a greater chance of surviving not only birth, but well beyond that. The idea, obviously, is that people will donate money to the program to help in these efforts. I first heard about this on the radio a few months ago. When I stopped to pay attention to what they were talking about, I got mad. Really mad. So mad that I turned the radio off. Let’s be honest here, we expect all babies in America to be born alive and healthy. We have some of the most advanced medical technology in the world. We have some of the best doctors in the world. I think that’s why when a baby in America dies before or during birth or is born unhealthy, we are shocked. How could this happen? It is not a shock to us when we see poverty and famine in Third World countries, where babies die every day. I think it’s almost more of a shock that babies are actually born in such dire conditions. How can a woman carry a baby to term when she herself is malnourished? It doesn’t make sense. It doesn’t seem fair. As the weeks went on, I continued to hear the World Vision advertisement and each time I listened to more of the message, until finally I had heard all of it. And right along with that God was telling me that they are all His children. Every life created, every baby born is His. And they all deserve a chance to live until age 5. It doesn’t matter whether that child is born in Africa, India, Haiti or America. What makes babies in America any more special than babies in Haiti? Nothing. Absolutely nothing. In my eyes, my children are more special than any others because they are my children. In God’s eyes, they are all the same. He loves them all unconditionally. Kyleigh is no more or no less important to God than a baby born on the same day at the same time in another country. As humans, we have a hard time with this. Or should I say, as Americans, we have a hard time with this. We feel like we are entitled to so much more than anybody else. 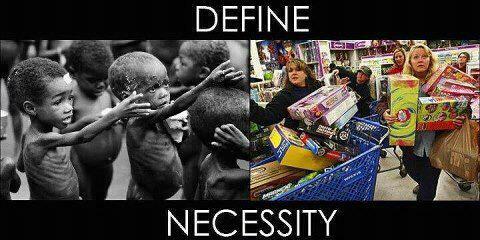 This Friday, Black Friday, is a great example of that. How ridiculous is it that people line up hours and hours before a store opens to be the first in the door to get that one toy that Johnny wants for Christmas?? How ridiculous is it that every year, stores open earlier and earlier so that people can get the best deals earlier than last year?? Or have more time to shop?? I get that it’s a great time to get the best bargain. But is that what it’s all about? My oldest son wants a Lego set for Christmas. It costs almost $100. He’s five. He doesn’t need a one-hundred dollar Lego set. Yes, I’m sure I could find some great Black Friday deal and get it for less. But guess what? I’m not going to. I am going to take the opportunity to teach him a lesson about not getting everything we want. And I guarantee, he will still be a happy boy come Christmas morning. The consumerism in this country is out of control and honestly, it’s sad. It is sad that people gripe and complain about having to stand in line, in the cold, waiting on the bargains when there are people on the other side of the world standing in line, hungry, waiting to get clean water. I have seen billboards around town lately for Giving Tuesday, which is November 27. I love it. I think it’s a great idea. I wish I had Googled it before yesterday. 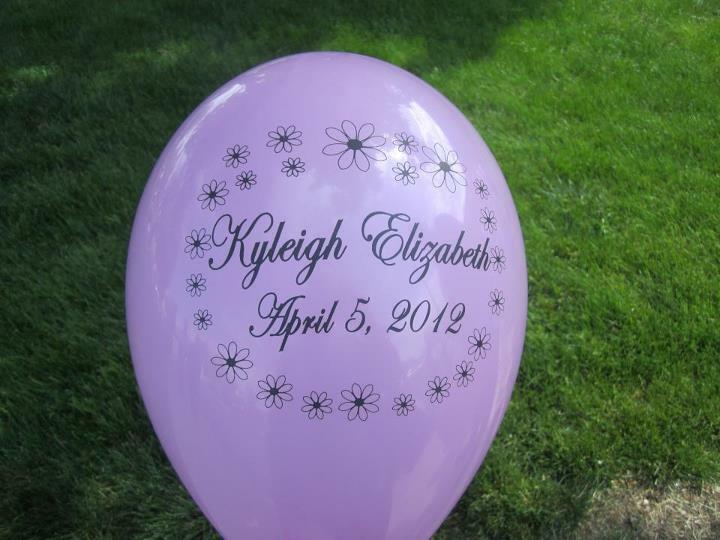 When I did look it up, the first idea that I had was to find a way for not only our family, but others, to give to Kyleigh’s Gift, the fund that we have set up through The Liberty Hospital Foundation in memory of Kyleigh. At some point, we will meet with people from the LH Foundation and decide what to do with the money. We have a few ideas and will collaborate with the hospital when the time is right. Whatever we end up doing, we want it to benefit others who have lost a child. We want to do something to support those who are going through what we are going through. Our hope is that whatever we do is ongoing. That means that the funds must continue, as well. This seemed like the perfect opportunity. But how do you get others to give to your cause? We listen to the radio every morning from the time we get up until the time we leave the house. It is on during every meal and always when we are cooking and cleaning up. When we turned it on this morning, K-LOVE’s featured cause was Survive to Five. All day, they have been talking about the Survive to Five program and asking listeners to sponsor a child through World Vision. We currently sponsor three children. I will admit that we aren’t the best at it. We send our money every month, but when it comes to communicating through letters or gifts, we have some work to do. It is easy to sign up for automatic withdrawal. It takes time to sit down and write a letter or draw a picture. We are not in the position to sponsor another child right now, or else I would have called today to sign up for one more. Instead, God led me in another direction. I don’t need to worry about building up the Kyleigh’s Gift fund. That will happen over time through family and friends. I know that God will work through Kyleigh’s Gift when the time is right. Right now, the focus is on others. The focus is on those babies and children in Africa, India and Haiti who are on the brink of not seeing their 5th birthday. The hope for my family is that we will focus on the three children that we sponsor. What can we do to teach our own children about these three boys who don’t have Legos to play with? How can we pray for these boys as a family? When can we take the time to sit down to write letters and draw pictures? How about skipping that meal out so we can send a birthday present each year? Our sponsorship not only directly helps our sponsored child, but their family and community, as well. Is our monthly gift providing clean water to their community? Is that clean water keeping babies and children alive? We like to think so. What can you do? How will you give this year? Will you give up a meal out each month to sponsor a child? Will you skip the Black Friday lines (along with me) and take some of the money you would have spent to provide clean water for those in need? If you do stand in the Black Friday lines, will you take the money that you saved from getting the best deals and buy a fruit tree or chickens for a farmer in South America? If you don’t give through World Vision, where will you give? How can you give someone else hope? Kyleigh has taught us a lot. One of the things that she has taught me is that we are all the same in God’s eyes. While I was grieving for the loss of my baby girl, another mother in another country was doing the same. Her grief was just as intense. The love for her child was just as powerful. God loves both of us the same. He loves both of our children the same. God also provides for both of us. He uses you and me to make this happen. Help me provide for someone else in need during this season of giving. That’s a brilliant lyric from a new song by my favorite artist. I love TobyMac’s music…good stuff. Always a fitting and appropriate subject but more so this week than many others. For the third time this year our God has called another Home from within my sphere. Not from my inner circle, but a member of my extended family none-the-less. This was a man with a genuinely good heart who ultimately succumbed to the same daemons that snatched breath from my dad all those years ago. It was a painful road for him and for his family but I pray that the same Source that gives me hope for the joyful reunion planned for the future will likewise bring his family peace in the days and months ahead. Hence the reason for this post. Thoughts that have been brewing in my mind over this past week I figured would spill out in ink when the time was right. I don’t have much time these days to write, but as today caps day 1 of my vacation, now’s a great time. Salvation is an interesting thing. It means a lot of things to different people but there’s certainly a time element involved. If the Christian life should be thought of as a progressive walk with God, there is an initial step that puts us on that pathway with Him. In technical terms this is what we mean by Justification, or the moment that we are “made right” with God. Now of-course to walk with God you must know where this path begins, and that pathway is illuminated by God Himself. There’s another technical term for that as well and some call that Prevenient Grace. You may have heard the term “Calling” before…that’s it. God calls us to a path and we can accept or reject this offer – free of charge. It’s our choice and it’s not by coercion but by election. But the path doesn’t stop the moment we’re called. While it’s true that at that moment we’re signed, sealed and delivered for God, we’re not called and immediately zapped up to heaven. Ironically I struggled with this in my youth until the moment I realized this life is not about me, but all about Him. Truly there’s something liberating in that…but that’s another story. Back to the pathway – we must choose to continue to walk. Life is designed for us, prepared for us (Ephesians 2:10) to be lived abundantly. It doesn’t matter your profession, experiences, influence or income. Our purpose for being created was designed, foreordained, and while many might find the objectionable, I simply find it comforting. So what about those that clearly step off the path? What about those that don’t finish well…don’t fight the good fight or finish the race? Choosing to walk the path is a daily one. Again another technical term is helpful here – Santification – or to be set apart for the designed purpose. Keep in mind that the entire pathway is metaphorical for salvation so it’s appropriate for the Christian to say that I was saved, that I am saved, and that I will be saved. It’s this last part that I think can become quite the stumbling block for some. Many good men and women, Christian men and women, fail to keep their eyes on the prize and ultimately succumb to the temptation to regress to a life that’s lived for themselves and not for others. While they not only miss out on the abundant life promised by Christ (John 10:10), they can spiral into a self-promoting state that blinds them to the events, people and witness to which they were originally called. This doesn’t mean they go without influence. It simply means they miss out. By their own choice and to their own determent. It’s interesting to me that Paul writes that “…neither death nor life…can separate us from the love of God.” In the same chapter in Romans (chapter 8:30) he writes, “and these whom He predestined, He also called; and these whom He called, He also justified; and these whom He justified, He also glorified.” Glorified is the last step. It’s the moment when our bodies die and we are made complete as we transition from earthly form into eternal being. There’s the last technical term in salvation – glorification. It is the point in time that is instantaneous with death. We go from here to there. Put plainly we put on immortality or we are glorified. But if you look back at v 30 there’s something missing. Notice that the stages of salvation are past-tense in that they already happened. We are called, justified and glorified. Once we are saved we are always saved. Eternally sealed and destined to spend eternity in the presence of our King. But there’s something absent from the verse. Although we are instantaneously both justified and glorified, we’re most certainly not sanctified. To be sanctified we must live and more specifically, we must choose to live daily for Christ. The more we do this the better we get at it, but we’re never completely successful and we’re always tempted to regress. We’re not less sanctified, as if we could ever be less Christian, we’re just not living to the standard to which we have been called and make no mistake, we suffer for it. The moment we get out of step with the path that God prepared for us is the moment we start to live for ourselves and not for others. To the question then – is it essential? I think the answer is that it depends. To me there is great comfort in knowing that the man I knew – whose heart was genuine – is eternally secure in a place where he finally knows peace. His salvation was never in question from the moment he said yes to God’s free offer. But it matters profoundly if you consider the influence that he had on the world. No doubt I’m a better man for having known him, but I doubt in the final months / weeks / moments of his life did he feel as if he was walking with God. It matters because you could not look at the last few years of his life and say – yes, I see the abundant life that Christ promised for him. You can see someone not living to his potential and for that I feel great empathy. All I can say today is that I love you friend, that I’ll miss you but rest assured, I’ll see you soon. Remember the song that I spoke of here? I finally figured out what it is.